The Subaru BRZ is getting long in the tooth and fans are wanting the new-generation model to get here soon. For now, all they get is a new Magnetite Gray exterior color for the 2019 BRZ. This new color is available now in Japan as they just announced the new shade of gray is appearing on the BRZ STI Sport. It should also be available in other global markets soon. Since its launch in February 2012, the BRZ sport coupe has been an affordable fun-to-drive two-door sports car around the globe. While sales have dropped dramatically in the last few years, it will remain in the Subaru stable. Recent reports say Subaru and Toyota have both confirmed the rear-drive sports coupes will see a next-generation model coming soon. How soon? The remodel will come sometime in 2020-2021 and it will get the new Subaru Global Platform. 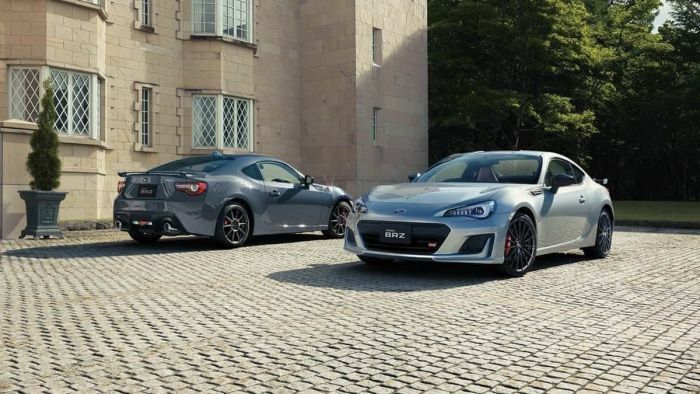 We’ve also heard the next-generation Subaru BRZ/Toyota 86 coupe could get a new engine as the two Japanese automaker attempt to improve the excitement and emotional appeal for the rear-drive sports car. We do know the next-generation BRZ/86 will keep the Subaru Boxer engine and transmission. What we don’t know is what engine will be under the hood. Last April, Toyota sources told The Japan Times, the next-gen BRZ/86 sports coupe will come with a new FA24 2.4-liter turbocharged Boxer engine sourced from the Subaru Ascent family hauler. This has not been confirmed by Subaru or Toyota, but unnamed sources say it’s a good possibility. Until the new model arrives, performance fans get a new Magnetite Gray exterior 2019 Subaru BRZ STI Sport in Japan. It could be another year before the next-generation Subaru BRZ is revealed in the new shade of gray. Stay tuned.